Truck lines as all truck companies across the nation, have a responsibility to American consumers — on time delivery. These companies have a commitment to ensuring the safe delivery of the products within the trucks. No matter what the cause of the truck crash, if you’ve suffered a severe injury, you should contact the Killino Firm to find out if you qualify to seek compensation for your losses. Our experienced injury and death attorneys will dig deep beneath the surface to find out exactly what happened and why. Once we determine fault, we will fight aggressively to ensure the truck line, truck driver and any other responsible parties are held accountable. 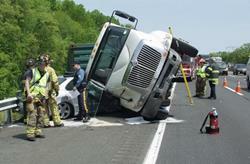 At the Killino Firm, our attorneys are well trained and experienced in handling even the most complex trucking crashes. We are dedicated to exhausting every tactic possible to ensure that you and your family recover the maximum amount of compensation possible, For an aggressive attorney who cares about Americium safety, contact the Killino Firm today.